I have been lucky, this summer, to have a job that requires me to read all kinds of books I might now have picked up on my own. Oh sure, some of them are books I won't look at again, but there have been some gems in there, and one of them was Jennifer Close's Girls in White Dresses, a collection of related short stories about girls in their twenties. It sounds like the setup for a romantic comedy, or yet another summer book about weddings, but I must say I was pleasantly surprised to discover it's much more than that. The first story centers on Isabella, who feels like the book's main character even though Close also writes about her friends Mary and Lauren quite a bit as well. "The Rules of Life" is about Isabella's sister's wedding, which must have been in the late '80s or early '90s based on the description of the bright blue bridesmaids dresses. Isabella was just a little girl, and the story is her memory of the wedding and all the work it required. In real-time, Isabella has just finished her undergrad and is packing up to move to New York with her friend Mary when she finds her own blue dress in the back of the closet and decides to put it in the dress-up bin. That first story really sets the tone for the book, with its funny but not too sentimental look back at a wedding, as well as its explanation of where these girls are in their lives. Isabella doesn't take memories of her sister's wedding and use them to fantasize about her own; she's excited about moving to New York for reasons besides trying to find a boyfriend; there's no pining or whining or find-a-man pacts, it's just a 21- or 22-year-old girl getting ready to leave home. Although the stories are mostly about Isabella, Lauren, and Mary, and what happens over the course of their twenties, Close also includes stories about their mutual friends or colleagues. There's a bride who has six wedding showers and expects Isabella, Lauren, and Mary (and others) to attend each of them. There's a story about a friend who's long-term relationship is flattened because of her boyfriend's dedication to Obama's campaign. And, perhaps my favourite of the peripheral stories, the story about the friend who's parents are pseudo-hippies on a farm in Vermont. The core of the book, though, is the three main girls, and how their stories weave together so that in a story about Lauren we learn something about Mary, or Isabella, and vice versa. As the book progresses, the gaps in time between the stories lengthen and recede, making the experience feel like you're quickly catching up with friends who you don't see as often as you'd like. Mary goes from engaged to having a baby, Lauren goes from waitress to realtor, and Close suggests the in-between without feeling the need to put it all out there. The weddings, it seems, are incidental, and despite the book's title, weddings are not at the centre of the book, which is about friendship and growing up far more than it is about marriage. 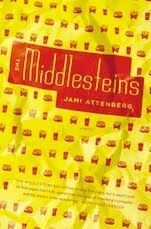 I have read a lot of books that are supposed to be about my generation, and the majority of them ring true in various ways, but Girls in White Dresses gets at something many narratives miss: how female friendships, which start off so tight and all consuming, become looser as you get older. You don't need to spend an hour on the phone every night, or live together, or whatever, and it doesn't necessarily have anything to do with men, it just happens. Close's ability to capture that feeling with humour, and slide in the built up annoyance over weddings (they are expensive!) 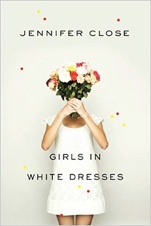 makes Girls in White Dresses a great read, and perhaps a cathartic way to wind down the summer wedding season. the book is really nice i recommend every one to read it u will surely love the story.. thanks for sharing!! This book is really good, I love this story, Girls in White Dresses is a spectacular title for a novel.